Some years ago, at twilight, I found myself standing on the observation deck of the Empire State Building in Midtown Manhattan, New York City. As the gloaming deepened, millions of matrices of lights in this dazzling megalopolis began to glow and sparkle below, arranged geometrically in scores of soaring skyscrapers spreading in all directions. The tapered Art Deco metallic crown and spire of the 77-story Chrysler Building was a radiant beacon of light arrayed in graceful, symmetrical arcs. A muted cacophony of traffic sounds and braying car horns drifted up from the depths of the urban canyons a thousand feet below. Midtown Manhattan at dusk, dominated by the towering Empire State Building. Just a week earlier, I had been in another enchanting, iconic place – a remote archipelago in Alaska, “the final frontier” – on the opposite side of North America. Not only was it on the opposite side of the continent, but it was the opposite of New York City in an even more important respect. Instead of swarming with millions of people, it was swarming with millions of spawning Pacific salmon. It was pure wilderness, devoid of people and pollution, and as a result, teeming with other life forms in Biblical abundance. The Alaska wilderness I’d left behind. 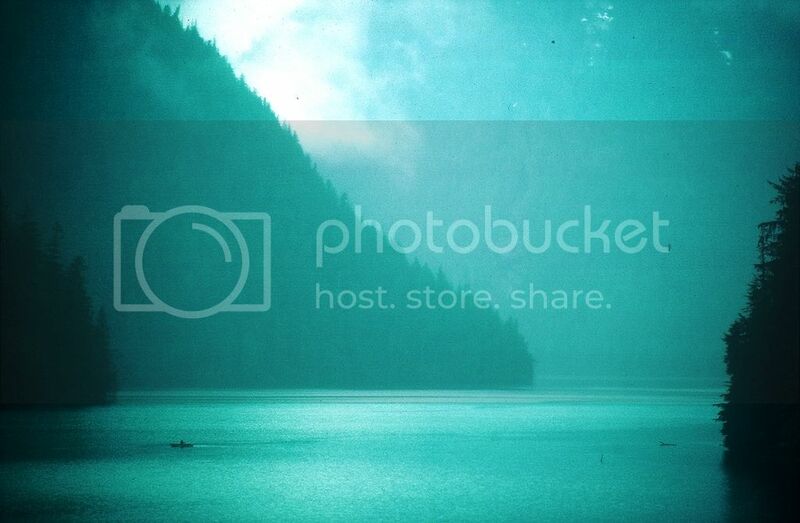 A friend in a skiff rows across Misty Fiords National Monument in the southern portion of the Alaska Panhandle. I was finishing a four-month stint at a remote wilderness fisheries research camp on Chichagof Island, as a fisheries technician with the Alaska Department of Fish and Game, tagging and counting spawning pink, Coho, chum and sockeye salmon, and trying to elude the clutches and jaws of grumpy grizzly bears. All across the planet, sprawling urban areas filling with tens of millions of more people year after year after year are swallowing up open space and natural habitats. But much more wilderness is succumbing not to urban development per se – that is, to residences, strip malls, schools, office buildings, factories, freeways and pavement – but to the other human activities and infrastructure in rural areas needed to support urban and rural populations: agriculture, logging, oil and gas drilling, mines, power plants, power lines, dams, harbors and so forth. Forests are falling to make way for more farms (crops and livestock) to feed ever more people, as well as to provide more lumber, pulp, paper and other wood products consumed by those same people. Dams and reservoirs are permanently altering native riverine and aquatic habitat, home to fish and invertebrates that depend on flowing, clean water. Biologically productive and diverse wetlands are being drained, dredged, filled and polluted. Wildlife is being poached and slaughtered for bushmeat and animal parts such as ivory and horns. Even clean, “green” energy sources such as wind and solar can despoil habitats and kill large numbers of birds and bats. A human-caused biological holocaust is well underway, and accelerating. Recently, yet more damning evidence of this ongoing assault on the world’s remaining wild places and its beleaguered biodiversity was revealed to the world. Globally important wilderness areas are overlooked in conservation policy. Extensive losses of wilderness have occurred in the last two decades. Efforts to protect wilderness areas are not keeping pace with its loss. 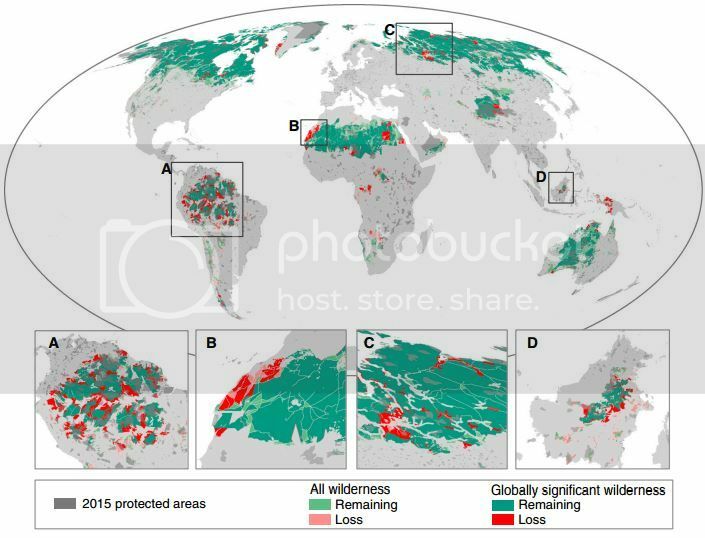 Wilderness losses since the early 1990s. The Current Biology paper documents “alarming losses” of global wilderness areas in the last two decades alone – adding up to fully one-tenth (1.3 million square miles, or 42 percent of the contiguous United States) of all remaining wilderness in the world. The greatest destruction took place in the Amazon, which lost 30 percent of its remaining wilderness, and central Africa, which lost 14 percent. It is not just a coincidence that both the Amazon and central Africa are being subjected to enormous, exponential, explosive and ecologically ruinous human population growth. The Current Biology study’s Australian, American and Canadian authors state that the “trajectory of wilderness loss in the Amazon is particularly concerning.” Among other important attributes, the Amazon River Basin contains a vast number of endemic species of flora and fauna found nowhere else on Earth. 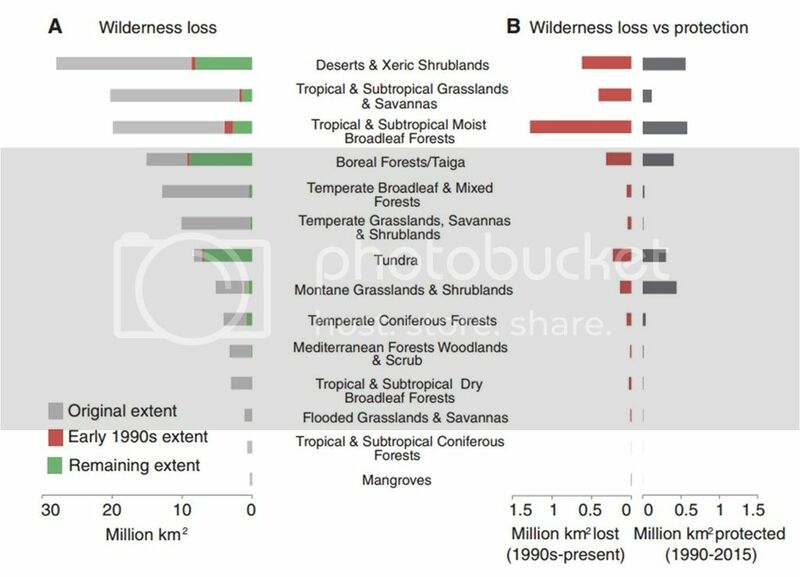 Wilderness losses vs. protection by habitat type. The planet’s remaining wilderness shelters many of the terrestrial mammals on the “Red List” of threatened and endangered species maintained by the Switzerland-based International Union for the Conservation of Nature (IUCN). Wilderness area vegetation and soils also hold huge stocks of carbon, which are crucial in mitigating the buildup of carbon dioxide in the atmosphere and resultant climate change. The Current Biology paper concludes by urging governments, NGOs and international institutions to officially protect remaining large wilderness areas, establish conservation corridors between protected areas, and collaborate with indigenous communities in and around wilderness areas. Indigenous peoples often have a vested interest in the conservation and management of wildlands in which they have resided as hunters and gatherers for millennia. Here in the United States, the National Wilderness Preservation System created under the Wilderness Act of 1964 now preserves some 762 Congressionally designated wilderness areas, comprising 109 million acres, or approximately 4.5 percent of the area of the U.S. It’s not enough, but it’s a good start. For one thing, that large acreage is a bit misleading, because many wilderness areas consist mostly of “rock and ice” that could not be developed or degraded anyway. One state alone – Alaska – contains more than half of the total acreage of designated wilderness in the U.S., that is, more wilderness than the other 49 states combined. It is not a coincidence that Alaska also has by far the lowest population density of any state in the country: 1.3 persons per square mile. Wyoming is the closest at 6.0 persons per square mile; California has 251 people per square mile. The country as a whole averages 90 people per square mile. Fortunately, much of California’s population density is concentrated along the coast and in the Central Valley, leaving large areas of the state’s interior and north with much lower densities. That doesn’t mean these habitats are pristine wilderness, just that they aren’t plastered with people and buildings. Many of California’s low-population-density natural habitats and wilderness have in fact been degraded over the years by the multitudes living nearby and elsewhere in the state – by overgrazing, logging, mining, dirt bikes, dams, agriculture, drainage, air pollution, noise, water diversion, road projects and the like. But thanks to the pioneering efforts of John Muir, David Brower, the Sierra Club and countless conservationists, California boasts a respectable amount of both designated and de facto wilderness. As is well known, the late Sen. Nelson was very concerned about the environmental consequences of unending, rapid U.S. population growth, and the mass immigration that had begun to fuel it from the 1980s onward. At Nelson’s urging, in the 1990s the Wilderness Society board adopted a policy calling for U.S. population stabilization, and acknowledging the need to reduce both immigration and fertility rates if this was to be accomplished. Not long after Sen. Nelson died in 2005, the Wilderness Society quietly abandoned this policy. Apparently it made too many politically correct board members uneasy and queasy. I had been a long-term donor to and supporter of the Wilderness Society, on a modest scale admittedly, but upon learning this, I stopped and have not donated a dime to them since.